More than 205,000 new drugs are marketed worldwide every year, most after undergoing the most archaic and unreliable testing methods still in use: animal studies. The current system of drug testing places consumers in a dangerous predicament. According to the General Accounting Office, more than half of the prescription drugs approved by the Food and Drug Administration (FDA) between 1976 and 1985 caused serious side effects that later caused the drugs to be either relabeled or removed from the market. Drugs approved for children were twice as likely to have serious post-approval risks as other medications. Many physicians and researchers publicly speak out against these outdated studies. They point out that unreliable animal tests not only allow dangerous drugs to be marketed to the public, but may also prevent potentially useful ones from being made available. Penicillin would not be in use today if it had been tested on guinea pigs--common laboratory subjects--because penicillin kills guinea pigs. Likewise, aspirin kills cats, while morphine, a depressant to humans, is a stimulant to cats, goats, and horses. Human reactions to drugs cannot be predicted by tests on animals because different species (and even individuals within the same species) react differently to drugs. Britain's health department estimates that only one in four toxic side effects that occur in animals actually occur in humans. Practolol, a drug for heart disorders that "passed" animal tests, causes blindness in humans and was pulled off the market. Arsenic, which is toxic and carcinogenic to humans, has not caused cancer in other species. Chlomiphene decreases fertility in animals but induces human ovulation. The anti-inflammatory drug phenylbutazone breaks down nine times faster in humans than in rhesus monkeys. Diethylstilbestrol (DES), an animal-tested drug that prevents miscarriages, caused cancer and birth defects in humans before its use was restricted. 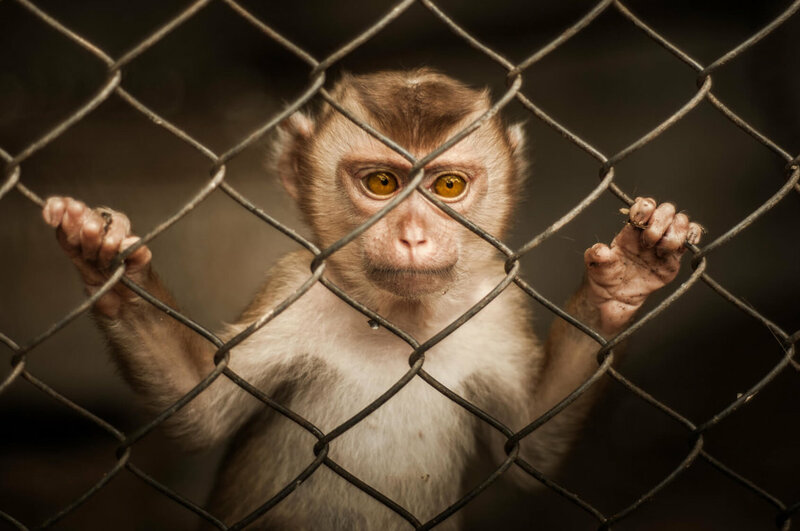 Many arthritis drugs that passed animal tests, including Feldene, and Flosint, have been pulled from the market because they caused severe reactions or even death in human beings. Experimenters involved in a 1993 test of a hepatitis drug that led to five deaths were exonerated by a panel from the Institute of Medicine, which directly conflicts with the findings of the FDA. During the trials of fiauluridine (FIAU), the FDA contended that the scientists and their sponsors had committed numerous violations of federal rules governing clinical trials, including not spotting and reporting adverse reactions quickly enough. Dr. Morton Swartz, chairman of the Institute of Medicine committee, and a professor at Harvard Medical School said, "[F]indings from previous animal . . . tests using different doses and lengths of time didn't expose this drug's life-threatening side effects." Experimenters using animals are less apt to notice symptoms like emotional changes, dizziness, nausea, and other important but less obvious conditions. Animals are unable to tell experimenters how they feel, information that is necessary to help determine whether a drug can be tolerated by human patients. The British journal Nature reports that 520 of 800 chemicals (65 percent) tested on rats and mice caused cancer in the animals but not in humans. The same report illustrated different results between rats and mice used to test the same substance. It costs about $2 million to test a single chemical on rats and mice. Billions more are spent regulating the use and disposal of chemicals "proved" to be dangerous in animal tests -- chemicals which may actually present little or no risk to humans. Unfavorable animal test results do not prevent a drug from being marketed for human use. So much evidence has accumulated about differences in the effects chemicals have on animals and humans, that government and industry officials often do not act on findings from animal studies. The acne drug Accutane was marketed despite the fact that it caused birth defects in rats. A small warning label was placed on the prescription. In this case, the animal tests did reflect human reactions, and now hundreds of children have been born with birth defects caused by Accutane. Drug companies are in business to make money. That is done by marketing large numbers of drugs, many of which are copies of drugs already on the shelves. A report by Health Action International found that "out of 546 products on the market for coughs and colds in five areas of the world, 456 are irrational combinations. Three-quarters of the 356 analgesics on the market should not be recommended for use because they are dangerous, ineffective, irrational, or needlessly expensive." Of the millions of drugs on the market, only 200 are considered essential by the World Health Organization. According to the FDA, 84% of the new drugs produced by the 25 biggest drug companies had little or no potential for improving patient care. Only 3% were considered significant advances. As long as the pharmaceutical industry cranks out thousands of new drugs every year, the public must push for the implementation of reliable, non-animal testing methods to ensure the safety of these drugs. Sophisticated non-animal testing methods exist. According to Dallas Pratt, M.D., "[M]any systems using either animal or human cell or organ cultures, as well as plant materials and microorganisms, have been created with emphasis on those which are rapid, inexpensive, and can discriminate between those chemicals whose properties represent a high toxicity risk and those which are relatively innocuous." Highly complex mathematical and computer models can be used to further define the specific problems a product may cause in human use. Despite the inaccuracies of animal tests, and the many cases of dangerous drugs having to be withdrawn from the market after passing animal tests with flying colors, the FDA continues to require animal studies before a drug can be marketed in the United States. Today we have the knowledge to prevent much illness and human suffering, often by avoiding the hormone and chemical-laden meat and dairy-based diet common in the United States, by regulating against pollutants and dangerous pesticides, and by avoiding tobacco and other known carcinogens. As John A. McDougall, M.D., points out, "The present modes of treatment fail to result in a cure or even significant improvement in most cases because they fail to deal with the cause. The harmful components of [a meat-based] diet and lifestyle ... promote disease and thus the disease progresses unchecked. Present modes of therapy are intended to cover up symptoms and signs rather than relieve the cause of disease." Concerned people should write to their congressional representatives and demand an end to wasteful and inaccurate animal studies in favor of human-based research and treatments that actually help people. The National Institutes of Health, the world's largest funder of research, must be pushed to fund more preventive programs and human-based research. Meanwhile, avoid purchasing any drug unless absolutely necessary. Remember, the manufacture and sale of pharmaceuticals is big business. If you must take a drug, ask your doctor what clinical studies, not animal tests, reveal about the drug.